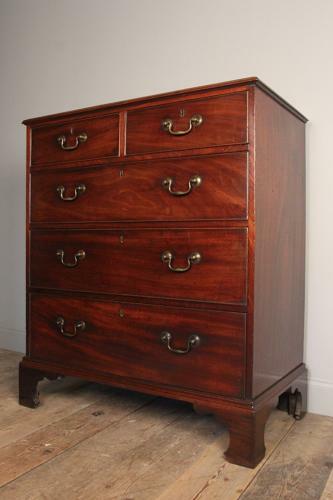 A superb example of an early George III solid Mahogany chest of drawers. Having a moulded one piece top with an arrangement of 2 short and 3 full length drawers, every drawer retaining the original lock, escutcheon and lacquered brass swan neck handle. Raised on a tall shaped bracket feet and retaining the original finish, fully oak lined. This chest with good proportions, in wonderful untouched condition with rich colour and patina throughout. English, George III.